All nylon flags are finished with heading and brass gromets. Offficially licensed product of the United States Marine Corps. POW / MIA Flags are available in Single Face (image is reversed on one side) or Double Face (image the same on both sides). Single Faced is shown as S/F and Double Faced is shown as D/F selctions below. 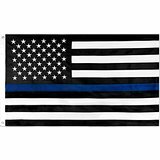 Thin Blue Line Flag U.S. This is a beautiful 3×5 nylon flag. Made in the U.S.A. The Thin Blue Line American Flag serves as a testament to the valor of police officers across the country. The courage exhibited by officers in the line of duty is represented by the Thin Blue Line in the center of the flag. The solemn black background acts as a memorial to the lives lost while shielding citizens from anarchy. Together, this flag is a stunning memento; prefect for showing support to Law Enforcement Officers everywhere.